One of the nice things about blogging is that from time to time I get sent products which might be of interest to me. This week I was sent some vegetable stock to sample by those lovely people at essential cuisine. Essential Cuisine mainly supply stock to the hospitality market, but they also sell to their products to the retail market. Suitable for both vegetarians and vegans, this stock helps to create wonderful home cooked meals and can be added at any stage in the cooking process. Vegetable stock is great for using in soups, stews, risotto and lots of other dishes, and I use it quite often in my vegetarian cooking. This looks like a vegetable stock of great quality and I am looking forward to using it over the next few weeks. 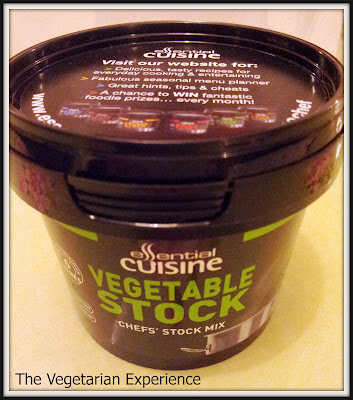 Essential Cuisine Vegetable Stock is priced £3.95 and makes 6-8 litres of stock. It is available from the Home Chef Essential Cuisine website.